A powerful technique to detect bone biomarkers has been developed for assessment of osteoporosis at the early stage. 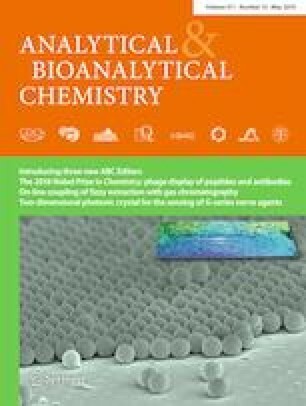 Two-dimensional multilayered gold-nanoparticle thin film (MTF-AuNPs) was demonstrated as a promising test platform for detection of bone biomarker, hydroxyproline (HYP), measured by surface-assisted laser desorption/ionization mass spectrometry (SALDI-MS). With strong surface plasmon resonance and excellent homogeneity, facilely prepared, highly ordered, and large-scale MTF-AuNPs revealed high sensitivity of HYP in the SALDI-MS measurement without additional matrixes, such as α-cyano-4-hydroxycinnamic acid (CHCA) and 2,5-dihydroxybenzoic acid (DHB). Furthermore, the mass spectrum of HYP with MTF-AuNPs was significantly improved in signal intensity enhancement, background noise reduction, and signal-to-noise ratio amplification. The excellent reproducibility of HYP spectra with only 9.3% relative signal variation could be attributed to MTF-AuNPs’ high absorbance at a wavelength of 337 nm, low heat capacity, superior thermal conductivity, and outstanding homogeneity. The calibration curve showed high linear correlation between mass spectrum intensity and HYP concentration in the range of 1 to 100 μM, covering the whole level in healthy people and osteoporosis patients. In particular, the serum sample was directly deposited onto the MTF-AuNP sample substrate without any pretreatment and its HYP concentration was then successfully determined. We believe that the combination of SALDI-MS and MTF-AuNP sample substrates would be a potential approach for bone biomarker detection in the osteoporosis risk assessment. Xi-Yu Pan, Chih-Hwa Chen and Yi-Hsuan Chang contributed equally to this work. The online version of this article ( https://doi.org/10.1007/s00216-019-01759-5) contains supplementary material, which is available to authorized users. We would like to acknowledge Mr. Chi-Ming Lee for his excellent technical support at TMU Core Facility. This work was supported by MOST 107-2113-M-038-004, MOST 105-2119-M-038-002-MY2, MOST 107-2622-E-038-001-CC2, and Taipei Medical University.